In a previous post, we introduced the basic concepts of quantum computing, during which quantum entanglement, Bell states and usual quantum gates such as Hadamard’s or Pauli’s were quickly addressed. Today, we’re going to explore some of these concepts and start having fun with quantum programming to illustrate these ideas. Quantum entanglement is a phenomenon which occurs when pairs (or groups) of particles are generated (or interact) in such a way that the quantum state of each particle cannot be described independently of the state of the other(s), even when the particles are separated by a large distance: the quantum state must be described for the system as a whole. Measurements of physical properties (position, momentum, spin, polarization …) performed on entangled particles are found to be correlated. Let’s imagine a pair of particles generated in such a way that their total spin is known to be zero. Now, let’s imagine that one particle is found to have clockwise spin on a certain axis. Because they are entangled, the spin of the other particle, measured on the same axis, will be found to be counterclockwise ! This behavior gives rise to paradoxical effects: any measurement of a property of a particle can be seen as acting on that particle. In the case of entangled particles, such a measurement will be on the entangled system as a whole. It seems to appear that one particle of an entangled pair “knows” what measurement has been performed on the other, and with what outcome, even though there is no known means for such information to be communicated between the particles, which at the time of measurement may be separated by any arbitrarily large distances (Einstein referring to it as “spooky action at a distance”). Such phenomena were the subject of a 1935 paper by Albert Einstein, Boris Podolsky, and Nathan Rosen (and several papers by Erwin Schrödinger) describing what came to be known as the EPR paradox. This thought experiment aims at the Copenhagen interpretation (more precisely, at the wave function collapse). Resolutions of the paradox have important implications for the interpretation of quantum mechanics. In quantum mechanics, a particle is described by a quantum state. This quantum state can be represented as a superposition (i.e. a linear combination) of basis states. In principle one is free to choose the set of basis states, as long as they span the space. If one chooses the eigenfunctions of the position operator as a set of basis functions, one speaks of a state as a wave function position space. For a quick recap on bra-ket notations, inner products, operators, observables and all that jazz, please, have a look at this (old) post. Let’s define the ket , representing a quantum state. The wave function (position space) can be defined as . Quantum frameworks do not provide single measurement outcomes in a deterministic way. According to the understanding of quantum mechanics known as the Copenhagen interpretation, measurement causes an instantaneous collapse of the wave function describing the quantum system into an eigenstate of the observable that was measured. Einstein was one of the most prominent opponent of the Copenhagen interpretation. In his view, quantum mechanics was incomplete. Commenting on this, other writers (such as John von Neumann and David Bohm) hypothesized that consequently there would have to be ‘hidden’ variables responsible for random measurement results. Einstein had been skeptical of the Heisenberg uncertainty principle and the role of chance in quantum theory. Or does the observer co-create physical reality by the questions he poses with experiments? (Bohr’s view). The EPR description involves “two particles, A and B, which interact briefly and then move off in opposite directions.” According to Heisenberg’s uncertainty principle, it is impossible to measure both the momentum and the position of particle B exactly. However, it is possible to measure the exact position of particle A. By calculation, therefore, with the exact position of particle A known, the exact position of particle B can be known. Alternatively, the exact momentum of particle A can be measured, so the exact momentum of particle B can be worked out. EPR tried to set up a paradox to question the range of true application of quantum mechanics: quantum theory predicts that both values cannot be known for a particle, and yet the EPR thought experiment purports to show that they must all have determinate values. Since 1972, experiments analogous to the one described in the EPR paper have been carried out, notably at the Saclay Nuclear Research Centre. These experiments appear to show that Einstein’s local realism idea is false, vindicating Bohr ! While EPR felt that the paradox showed that quantum theory was incomplete and should be extended with hidden variables, the usual modern resolution is to say that due to the common preparation of the two particles (for example the creation of an electron-positron pair from a photon) the property we want to measure has a well defined meaning only when analyzed for the whole system while the same property for the parts individually remains undefined. Therefore, if similar measurements are being performed on the two entangled subsystems, there will always be a correlation between the outcomes resulting in a well defined global outcome i.e. for both subsystems together. However, the outcomes for each subsystem separately at each repetition of the experiment will not be well defined or predictable. Note that this correlation does not imply any action of the measurement of one particle on the measurement of the other. Therefore it does not imply any form of (spooky) action at a distance or any violation of special relativity (effects propagating faster than light). This modern resolution eliminates the need for hidden variables, action at a distance or other structures introduced over time in order to explain the phenomenon. In 1964, John Bell showed that the predictions of quantum mechanics in the EPR thought experiment are significantly different from the predictions of a particular class of hidden variable theories (the local hidden variable theories). These differences, expressed using inequality relations known as “Bell’s inequalities”, are in principle experimentally detectable. After the publication of Bell’s paper “On the Einstein Podolsky Rosen paradox”, a variety of experiments to test Bell’s inequalities were devised. 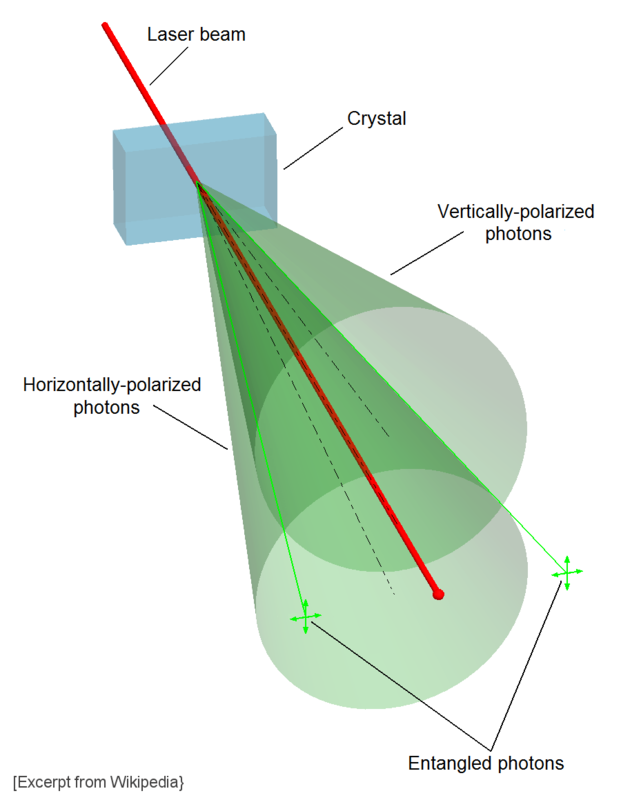 These generally relied on measurement of photon polarization. All experiments, like Alain Aspect‘s, conducted to date have found behavior in line with the predictions of standard quantum mechanics theory. Bell states are an import concept in quantum information science and represent the simplest examples of entanglement. An EPR pair is a pair of qubits that are in a Bell state together. 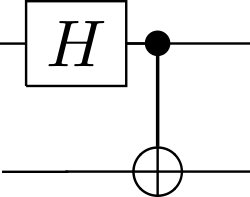 Because of the entanglement, measurement of one qubit will assign a value to the other qubit immediately in one of four ways, where the value assigned depends on which Bell state the two qubits are in. The phenomena can be used for example to agree upon random numbers in less time than it would take to communicate the numbers at the speed of light over the distance between the peers. We also introduced Pauli, Hadamard and CNOT gates, as well as quantum circuits. CNOT gates are of particular importance because they can be used to entangle and disentangle EPR states. Actually, any quantum circuit can be simulated to an arbitrary degree of accuracy using a combination of CNOT gates and single qubit rotations. The CNOT gate operates on a 2-qubits quantum register. The CNOT gate flips the second qubit (the target qubit) if and only if the first qubit (the control qubit) is . This gate sequence is of fundamental significance to quantum computing because it creates a maximally entangled 2-qubit state: a Bell state. Having all this in mind, it is now time to have a little fun and experiment quantum programming. Q# is a programming language used for expressing quantum algorithms. It was initially released to the public by Microsoft as part of its Quantum Development Kit. Q# language and compiler: Q# is a domain-specific programming language used for expressing quantum algorithms. It is used for writing sub-programs that execute on an adjunct quantum processor under the control of a classical host program and computer. Q# standard library: The library contains operations and functions that support both the classical language control requirement and the Q# quantum algorithms. 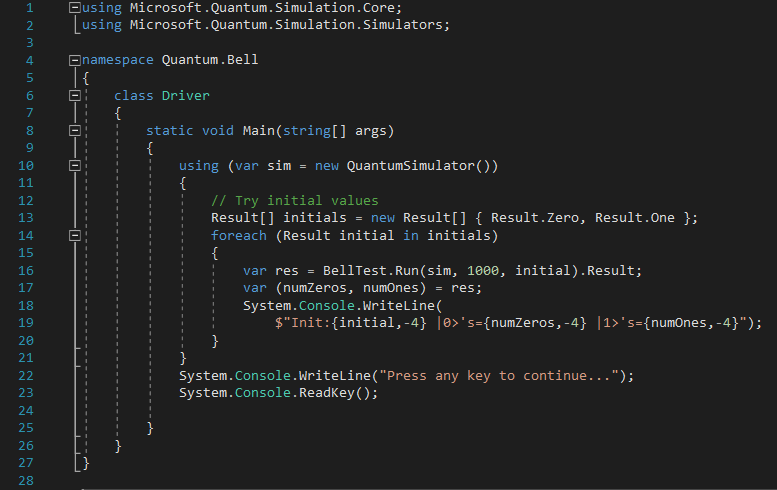 Local quantum machine simulator: A full state vector simulator optimized for accurate vector simulation and speed. 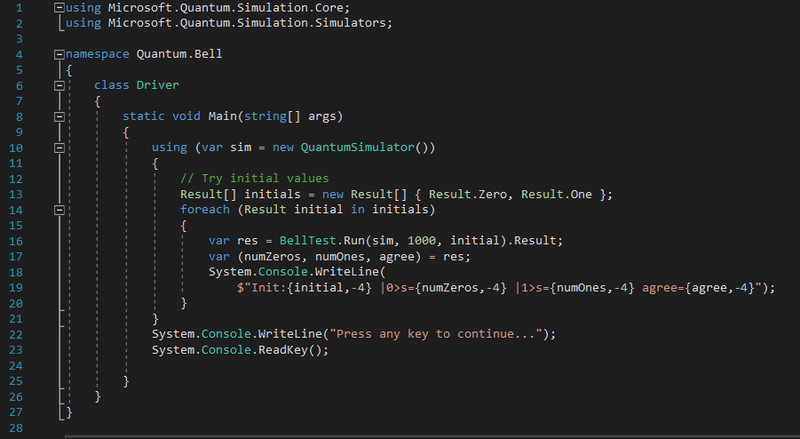 The quantum simulator that is shipped with the Quantum Development Kit is capable of processing up to 32 qubits (and up to 40 qubits on Azure). It runs on Windows boxes, as well as on real operating systems such as GNU/Linux or MacOS. The most prominent features of Q# are the ability to entangle and introduce superpositioning to qubits via CNOT and Hadamard gates. Note: the following example comes almost straight out of the Q# tutorial, since it suits nicely our pedagogical purposes. 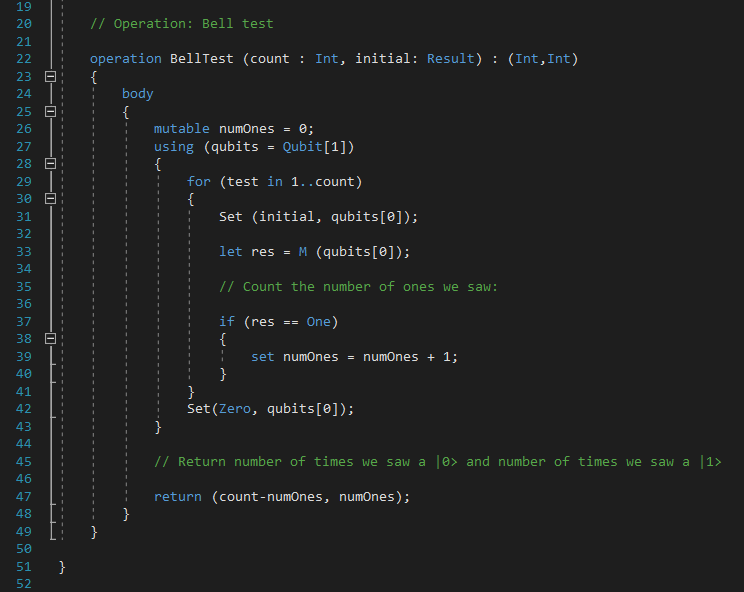 This operation loops for count iterations, sets a specified initial value on a qubit and them measures the result. 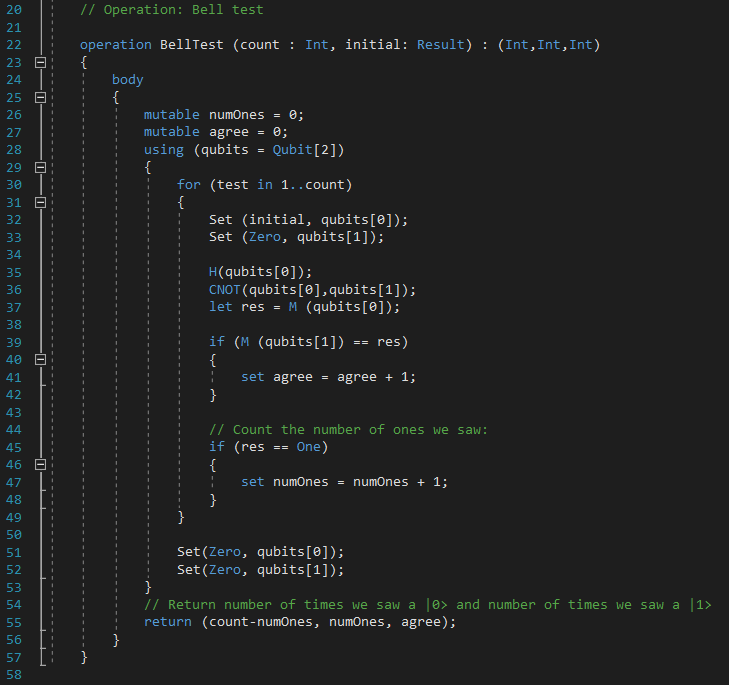 It gathers statistics on how many zeros and ones are measured and returns them to the caller (“classical” part of the application). 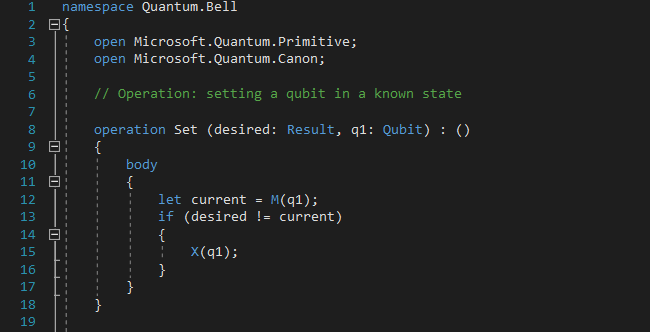 It also resets the qubit to a known state (Zero) before returning it, allowing others to allocate this qubit in a known state (required by the “using” statement, used to allocate an array of qubits for use in a block of code). So far, these are “only” classical results. Let’s add a bit of quantum weirdness ! Every time a measure is performed, the qubit is halfway between and ), so one gets (statistically) 0 half the time and 1 half the time. We have created a superposition. This gives us our first real view into a quantum state with Q# ! And now, let’s get into quantum entanglement ! We introduced a new return value (named “agree”) that will keep track of every time the measurement from the first qubit matches the measurement of the second qubit. Our statistics for the first qubit haven’t changed (50-50 chance of a or a ). But now when we measure the second qubit, it is always the same as what we measured for the first qubit. Our CNOT gate has entangled the two qubits, so that whatever happens to one of them, happens to the other ! Please note that if you reversed the measurements (the second qubit before the first), the same thing would also happen.